This is a paper I wrote back in freshman year of College Mark II (2010.) It’s not in my finest academic form, and I used MLA instead of Chicago, since that’s what I knew at the time. I figured it’s length and content were perfect for a blog entry as I have been lacking on any real substantial content lately, ESPECIALLY about the Byzantine Empire. In-text citations with works cited at the end. The Shroud of Charlemagne. Manufactured in Constantinople in 814. One of the primary achievements within the reign of Justinian I was the obtainment of silkworms from China. We will analyze how this event led to major changes within the Eastern Roman Empire’s economy and foreign policies. The Silk Road opened to Rome in the 2nd Century as caravans that traveled from China and through Persia worked their way into the outer provinces of the Empire. A chapter of the Hou Hanshu, a historic text from China, states that Roman contact was made by sea in AD116, which initiated a series of trades from there on out. (Hill) There are also Biblical mentions of silk, although the period translation from ancient Hebrew may be referring more to a very fine linen, there is one certain mention within the Book of Revelations during the description of the Fall of Babylon, as it was translated from Greek. “And the merchants of the earth weep and mourn for her, since no one buys their cargo any more … fine linen, purple, silk and scarlet”. (Revelation 18:12) So it is believed at the time the book was finalized, that the fabric was commonly known. China was the sole manufacturer of silk for thousands of years, and it wasn’t until the Emperor Justinian I in 552 obtained the first silkworm eggs. Prior to that, the Romans had to trade through their strongest enemy to the East, Sassanid Persia. Trade with Persia was costly, strenuous, and often dangerous, therefore it was evident a solution was needed. There was a high demand for silk in the Mediterranean during the reign of Justinian, both within Constantinople and into the outreaches at the highest extent of the Byzantine Empire. It was the prized fabric of the notably well-dressed Imperial court and an overall hot commodity in the area. Interaction with Persia needed to be brought to a minimum, and Procopius wrote of a solution. Although silk production began under the reign of Justinian I and Irene of Athens, it didn’t particularly pick up until several centuries later. It was necessary to breed the worms to have a significant production of the thread, so to do this would take a considerable amount of time. Thanks to the destruction of the Western Empire in the century prior, Constantinople had established itself as the economic superpower for nearly all of Europe and especially the Levantine Mediterranean realms. (Schoeser 27) So despite the work needed to establish a strong foothold on sericulture, the Romans found themselves in a strong opportunity. Initially, silk production was limited to just the Imperial Palace, with private spinners and weavers put to work to create the splendid garments for the emperor, empress, and entourage of the court of Byzantium, much like the private workshops they had for jewelers and perfume makers. Eventually commerce spread outward to the people of Constantinople and the Empire as a whole, and an overall monopoly on silk goods produced by the former Imperial workshops had spread as far as Francia in the west, but that wasn’t until the 11th and 12th centuries once the Empire had established a solid industry. Notable weaving patterns in early Byzantine textiles that still exist are the tabby, damask, twill, lampas, and tapestry weaves. (Muthesius 153) It seemed an entirely new sub-industry within the Empire was created to support this new weaving venture. Despite the silk industrial revolution that was occurring in Constantinople, trade for raw and finished silk goods from China was still very prominent for several centuries. The Empire continued to import raw silk thread and yarn from the East as to support their weaving industry, and to get there; it had to go through the Persian Empire. Each stage of the journey from China, either by land or sea, dyes and designs added value and increased its cost. The uneasy relations that Byzantium had with Persia often made the trade difficult and dangerous, so the importation of silk and other eastern goods were subject to strict government regulations on both sides. (Feltham 5) Prior to Persian control, the majority of silk going into Greek and Roman provinces was done by nomadic tribes coming from the steppes of Central Asia, who traded for goods such as horses and furs. An important question is raised in whom exactly, were the monks that Procopius mentioned. Sources point to them being Sogdian, which were a nomadic tribe that brought in silk from China, or even Persians. But why would either culture attempt to undermine their control of the trade? If it were in fact Persians that were the monks that Procopius mentioned, then they would be in direct violation of this law, which leads that hypothesis to be unlikely. At the time, other cultures were coming into the game plan as far as trade goes, including the Turks, whom would prove to be the ultimate downfall of the Roman Empire less than a millennium in the future, so it is still very unclear as to the origins of Procopius’ tale. The Vikings were well-known trades people during this time period, and had a considerable amount of interaction with Eastern Rome. There have been numerous finds in Viking archaeological sites that demonstrate the wide contact they had with the continent. 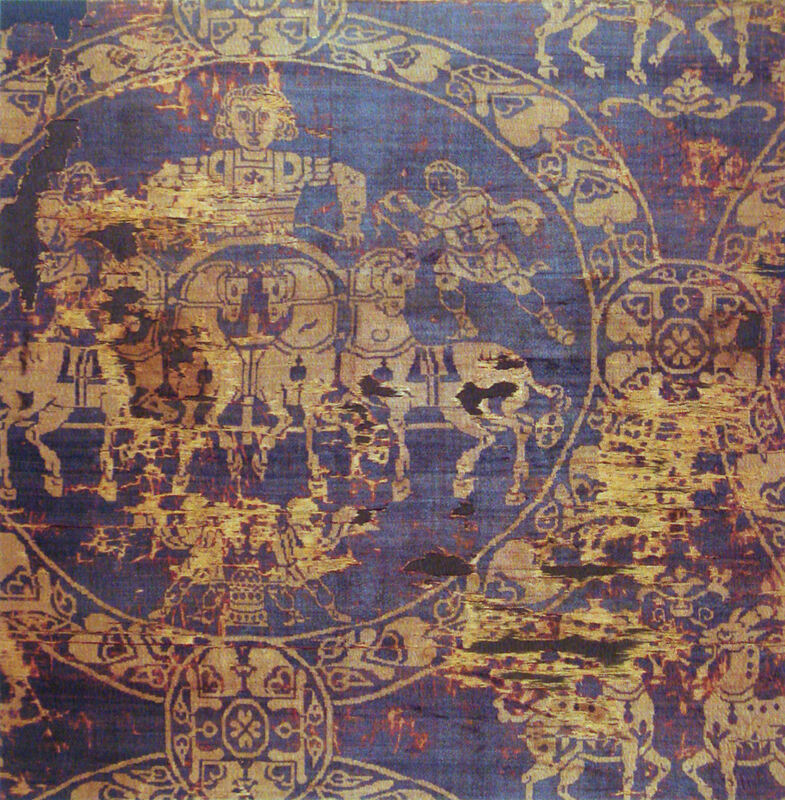 Silk from Byzantium is commonly found among other imported and domestic items of the Norse people. (Christensen) These examples were most likely brought back by the Varangian guards who were working under the imperial banner, and the extensive trade routes the Vikings set up from Constantinople to the Baltic. Despite the demand for the silk goods to be purchased by foreign cultures, the Empire strictly regulated how much could be sold. It was written within the Russian Primary Chronicle, “When the Russes enter the city, they shall not have the right to buy silk above the value of fifty bezants…” (Muthesius 165) In edition to the limit on how much one could purchase, there were also tariffs placed in effect, which regulated the flow of illegal trading. This insured the Empire’s foothold in the silk trade, and helped regulate the economic impact the industry would eventually have on the growing market, which would boom during the prime of Byzantium in the twelfth and thirteenth centuries. The interaction with Persia would not end immediately. Eastern Rome had to continue dealing with their menacing middleman while their industry was growing, and would be doing so until the Ottoman Empire came into play several centuries after the establishment of silk cultivation. For Justinian, however, the ancestors of the Ottomans would be his loophole to bypass the Persians. The Turks had no love for the Sassanids, and during periods of hostility in which the silk trade between the Empires was suspended, Byzantium attempted to make direct contact with China. This brought them into an agreement with the Turks, whom Justinian’s successor, Justin II, drafted a treaty with, and they supported the Empire against Persia. (Ostrogorski 74) Similar arrangements were made with Ethiopia for imports from India by sea, but they could simply not break the hold that Persia had on the Indian Ocean. Although the Eastern Roman Empire succeeded in becoming one of the foremost silk manufacturers of the Middle Ages, the path there began with a legend of stolen silkworms. This event aiding the shaping of a region that would be not only known for its beautiful textiles, but also for its strength in the Empire’s policies of trade. The Bible. King James Edition. Print. Christensen, Arne Emil. “The Vikings.” ReiseNet. N.p.,n.d. Web. December 2010. http://www.reisenett.no/norway/facts/history/the_vikings.html. Feltham, Heleanor. “Justinian and the International Silk Trade.” Sino-Platonic Papers 194. (2009): 5. Web. 8 Dec 2010. http://sino-platonic.org/complete/spp194_justinian_silk.pdf. Hill, John. ““Chapter on the Western Regions”.” The Hou Hanshu. N.p.,September 2003 . Web. November 23, 2010. http://depts.washington.edu/silkroad/texts/hhshu/hou_han_shu.html. Justinian I, “Codex Justinianus (529): Title LXIII. Concerning Commerce and Merchants.” The Civil Law. S.P. Scott A.M.. Cincinnati: The Central Trust Company, Digital. Ostrogorski, Georgije. History of the Byzantine State. 74. Print. Procopius, History of the Wars, Books VII (continued) and VIII. 1962 Edition. V. Loeb Classical Library, 1978. 229. Print. Schoeser, Mary. Silk. 27. Print. St. Theodoret of Cyrus. On Divine Providence. 4. 55. Print.